"My husband and I are so thankful for Lead Your Dog and our trainer Bri! We rescued a 2 year-old pointer mix in January named Hunter. Hunter was found as a stray and was suspected to have lived on the streets his whole life. He was very sweet with my husband and I and took to us and our home immediately. However, he was very nervous about everything , especially anything involving leaving our house. Taking him for a walk was miserable as he would essentially have a mental break down every time we took him more than a block from our house. He was terrified on walks, visibly shaking, barking and panting uncontrollably. After a few weeks with us he started to become very defensive, resource guarding his food as well as my husband and I from other people and dogs. His behavior was escalating very quickly and my husband and I felt very overwhelmed and unsure if we could handle him. We were referred to Bri and I cannot express how happy I am that we got hooked up with her! Bri was very flexible, working me into her schedule the day I called. She immediately made me feel more at ease with the situation and reassured me that with proper training Hunter would certainly be able to stay in our home. We did the 2 week board and train program and Bri kept us updated on Hunters progress and what they were working on every few days. She sent us videos and pictures, which were always fun and exciting to see. We have now had Hunter back in our home for about a week and my husband and I couldn't be happier with the results. Hunter is so much more confident and less nervous than he used to be. We are now able to take him for a long walk with no barking and or anxiety and he actually seems to enjoy it! Bri has been available all the time to answer any questions we have had since he's been home and gets back to us very quickly. We are so pleased and would absolutely recommend Lead Your Dog and Bri to anyone, especially those with rescue dogs. We are so thankful for all the hard work Bri put into training Hunter, it has truly changed our lives and his." "Our dog was such a mess when we met Bri. She completely turned Annie around and now she is such a pleasure to have in our home. It's amazing what a few commands, patience, and consistency can do for a dog. I am no longer afraid to have people over to our house or take her in public." "When I met Bri she was at the tail end of an extensive apprenticeship with a veteran trainer whose great work with dogs I was very familiar with, but Bri was ready to branch out. She joined me at my company, Dogs Listen To Me, for a period of a few months. Around this time, I was in the early planning stages of relocating my company, so I encouraged Bri too begin setting up shop for herself, offering whatever help I might be able to provide along the way. I knew that Bri was more than ready to help people live better lives with their dogs without my guidance as a trainer. Bri did fantastic work with all of my clients and their dogs and she has continued to do so for her own clients since the inception of Lead Your Dog. Since then, I have relocated to the West Coast, but have kept a close eye on Bri and have proudly referred my past clients in the Midwest to Bri for all of there canine needs. Every client I’ve ever sent her way has predictably reached out to let me know of their great satisfaction with the work Bri does. Perhaps my favorite thing about Bri as a trainer is that like me, she knows how to train a pet dog without the use of treats. She understands the vast spectrum of positive reinforcement options available to encourage a trained behavior and understands the value of a rewards system that doesn’t promote high levels of excitement in the dog(s). I truly consider Bri to be one of the better dog trainers I have ever encountered. She is always working to expand her knowledge and find creative solutions to behavior problems while staying firmly rooted in a core system that has been proven to be realistic and effective for dogs from any background. I would be remiss not to mention Bri’s uncompromising love for dogs. All of her own dogs are rescue dogs from various backgrounds with their own unique challenges, but you’d be hard pressed to find a more terrific pack anywhere; which has allowed Bri to open her home to wayward dogs, in service of other rescue organizations, including my own. I recommend Bri to any/all dog owners with complete confidence in her ability to help you find your way to a calm and happy dog." "Bri is excellent at what she does! She taught us a lot about our dog and how to communicate with him. Atlas, our pup, would pull on his leash and not listen to any commands if there were other dogs around. Now he does not pull and listens to commands. He's still interested in other dogs, but we learned how to manage his behavior and how to set him up for success." "We have nothing but great things to say about our experience with Lead Your Dog and trainer Bri. Last april, we adopted a 1.5 year old Basenji, Lab, Pittie mix, named Avery, filled with much love, energy, and nervousness. As time progressed and our initial “learned” training and communication skills for Avery fell by the wayside, we were in need of help and a change of approach in how we interacted with our pup. So began our search for a trusty trainer. After our initial consultation with Bri and evaluating the experiences we've had with our pup, we decided to enroll Avery in a 4 week off-leash Board and Train with layering of eCollar technology. Bri is highly knowledgeable in dog behaviors and answered so many of the questions we had. Throughout the whole time Avery was in training, Bri would update us occasionally on what they were working on, his progress, interactions with her pack, field trips, and observations of triggers for his nervousness—which you can see from her Facebook posts that she truly works to proof pups in all types of situations. 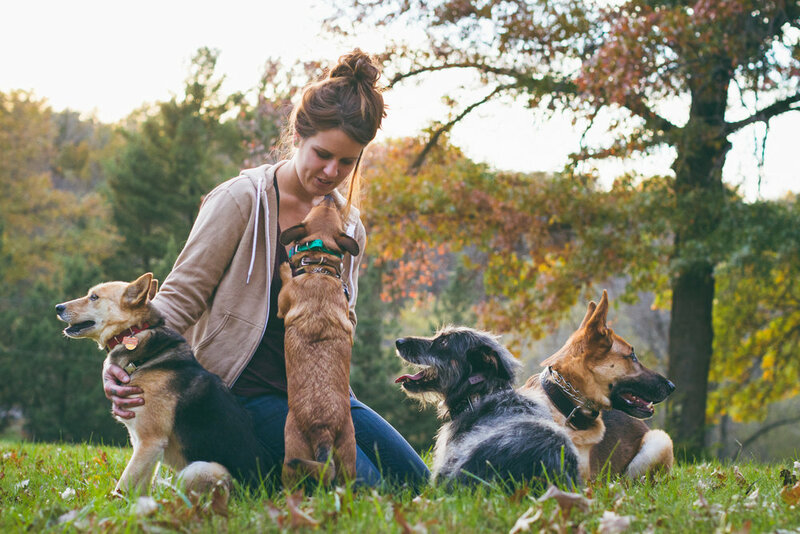 Mid-way through and at the end of the B&T, Bri conducts a lesson with you and your pup to show you all of the learned communication commands and provides you with skills to troubleshoot situations of breaking commands. While each of these sessions come packed with TONS of information and hands-on learning points, Bri makes a point to make your feel comfortable with the commands and working your pup. We have officially had Avery back from his training for over a week. (Even outside of the 4 week training, Bri has been super quick to respond to any questions that have come up.) The change that we have seen in our pup with the leadership of Bri to help us better communicate with our pup is truly incredible. Our nervous pup now has the skills to manage through situations, is more confident in completing commands, and looks to us for guidance. This has been a great investment for a long-term happy and healthy relationship with our pup." "Bri was the best! Patient, down to earth, really understands dogs and how to communicate with me during training. Did not know where to go with our adopted dog and the personality that showed up once settled in. Bri came highly recommended and now (after-the-fact) I cannot imagine working with anyone else. Our 'rescue' needs a lot more work but we now have the tools to work out any issues. Glad to be part of the Lead Your Dog family!" "Great with small dogs too! We needed help with our fearful, reactive chihuahua mix. After an initial consultation we began working with Stephen. We had never trained our dogs before and my boyfriend was anti-dog training prior to our experience with Stephen. Now he can't recommend him enough! Stephen, not only taught us how to train our dog, but also how to create the structure she needed to be more confident out in the world. He answered every question we had and was very patient with us. Now when I take her out in public people comment on how calm and well behaved she is. We can walk past other dogs without creating a scene! This process has given us a freedom to take her places I didn't think would be possible. Thank you!" "Bri is absolutely a life saver! After rescuing my 7 month old pit bull terrier I quickly realized that regardless of how many dog training videos I watched online I knew him and I both were going to need hands-on training with an experienced, passionate, understanding obedience trainer. After reading several reviews, talking to many dog owners as well as local obedience trainers I was referred to Bri. After 6 sessions with her, Hudson's behavior has improved ten-fold. Bri recognized my strengths & weaknesses with Hudson from the beginning and did a fantastic job of always reminding me of the why. I asked her a ton of questions throughout training as well as a little push back or hesitation and time after time she gave me 100% confidence to trust in her training and the process. She told me to constantly practice with him, repetition is key! It worked! I highly recommend Bri to anyone looking for an effective obedience trainer that will educate you on the right training tools to ensure a happy relationship with you and your dog for life!" "We just finished a 5-week training with Bri Rice of Lead Your Dog. We could not be more impressed and happy with Bri's results. Our dog Luna is still the same, fun-loving dog she always was but with Bri's help, she is much more attentive, calm, and respectful. The change is remarkable... and fast! Bri has an excellent rapport with dogs and their owners, teaching us simple, helpful things that have made life so much easier for us and Luna. Lead Your Dog is worth every penny and we cannot recommend their work highly enough. Thank you, Bri!" Check out more testimonials on our Facebook Page.